Garage door locks, also known as T-handles, come in a variety of sizes (long lugs, short lugs, square spindle, diamond spindle). There are also quite a number of garage doors that are fitted with half euro/oval profile cylinders. Because security is poor with this type of lock a popular solution for securing the 'up and over' garage locks are the Enfield garage bolts. 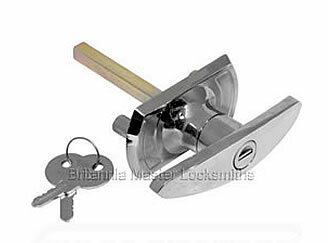 They provide additional security to the standard lock and are suitable for single or double garage doors. A further advantage with the Enfield Bolts is they can be keyed alike, so if you have a number of garages you can make your job easier when it comes to opening them by having the same key for all the locks.